Meetings of the international community at the United Nations are often the most effective way of advancing global knowledge on key development issues. 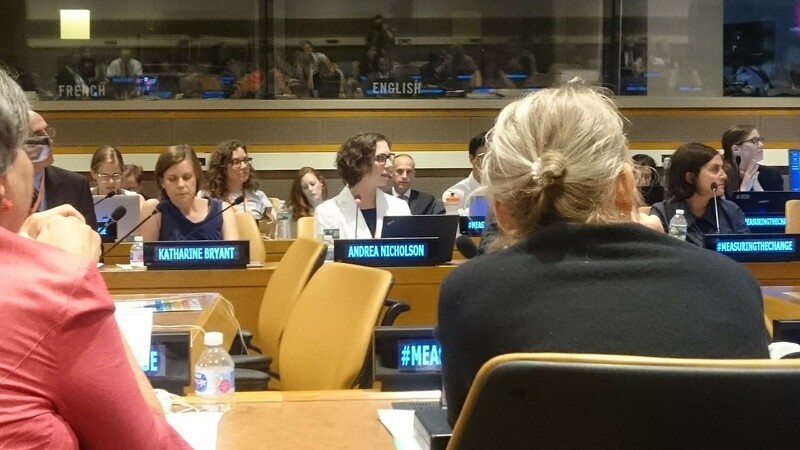 In July 2018, global antislavery leaders, including members of the Rights Lab at the University of Nottingham, convened at the UN to discuss tackling Sustainable Development Goal 8.7 — ending slavery by 2030. 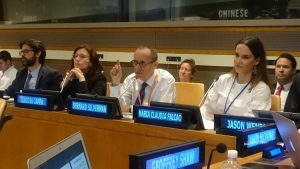 Rights Lab Beacon of Excellence leaders were invited to contribute to United Nations (UN) sessions on modern slavery across three days. Professor Sir Bernard Silverman, statistics and measurement specialist and ex-Chief Scientific Advisor to the Home Office, and Rights Lab Associate Directors Dr Andrea Nicholson, expert on slavery survivor perspectives, and Dr Alex Trautrims, slavery and supply chains specialist, shared experience and expertise on measuring progress in antislavery action, developing survivor-led activity, and ways for the global community to more effectively share knowledge. 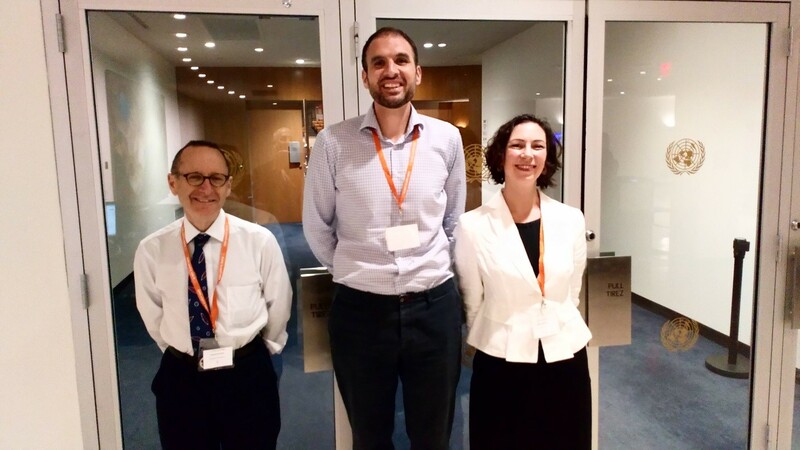 Andrea also presented at the UNU-hosted event “Modern Slavery and State Responsibility” alongside colleagues from the UN, the ILO, Kings College London, and Alliance 8.7. Andrea said: “The meeting was an opportunity to test theories emerging from research. It will result in a set of policy papers on the creative use of legal frameworks for the attribution of responsibility on states for modern slavery abuses in a range of difficult scenarios (e.g. where diplomatic immunity applies).” A second meeting planned for later in the year in London will bring in Rights Lab Executive Director Professor Todd Landman, who will share his perspectives on political regimes and their relation to state responsibility and modern slavery. This new complexity of data, and a parallel proliferation of antislavery actors and actions at state and civic level, brings with it challenges of how to use the data purposefully for change. There is a need to not only share good practice, but to translate research findings rapidly into usable content for policy makers and NGOs. Rights Lab leaders therefore participated in two other sessions at the UN. Andrea took part in a high-level ‘stock taking’ of progress held by Alliance 8.7 and UNU that introduced its new knowledge sharing platform. This seeks to accelerate the scientific study of ‘what works’ and help decision-makers to understand, use and access information, and to develop research-led infrastructures. 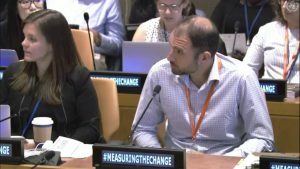 Rights Lab members are on the development group for the new platform, and Bernard and Andrea also attended a half-day development session for the platform at the UN, to further shape its content. The Rights Lab will be contributing content to this global open-access resource. Professor Trodd said events like this demonstrate the value of the transdisciplinary approach to modern slavery taken in the Rights Lab research: “As the world’s largest and most domain-diverse group of modern slavery scholars, we are unique in bringing diverse methods and tools to bear. The international policy community appreciates this breadth and richness. So this week, for example, in addition to the contributions by Bernard, Andrea and Alex, we were also represented in New York by Rights Lab PhD student and Director of Rights Lab partner NGO Survivor Alliance, Minh Dang.